velocity is for the target planet. For a rendezvous mission with Neptune and boostcoast the total weight ratio is about 15.5. 77.5 tons. A return to Earth for the boost-coast mission would have an Earth-departing mass of 797 tons and require about 24 years time. Traveling within our Solar System with a low 7sp and constant acceleration is very expensive! That is why deep-space spacecraft are low-mass vehicles and fly using short bursts of acceleration trajectories. To attempt a Neptune mission with chemical propellants in trans-Mars trip times is impossible in terms of the requirements. Hence the search at the dawn of the rocket age for new propellants, capable of higher Isp. 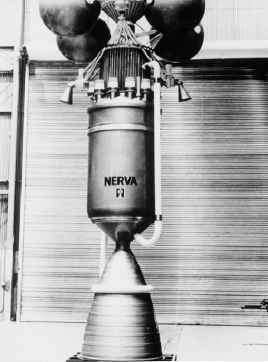 At that time, in the effort to improve Isp, hundreds of propellant pairs were tested, starting from the liquid oxygen/alcohol the Germans used on the V-2, with Isp = 290 s. In fact, we know now that in chemical propulsion Isp is limited by chemistry, that search pretty much ending with the liquid H2/O2 combination capable of Isp = 450 s. Slightly higher Isp are possible, but using propellants that are either too toxic (e.g. fluorine), or too toxic and too expensive (e.g. beryllium). Increasing the Isp decreases the trip time (see Figure 7.3). A second, no less crucial, consideration is power. In chemical propulsion, pro-pellant consumption is inextricably linked to power, because power is produced by burning propellants. For instance, combustion of H2 and O2 produces 13.5 MJ per kg of propellants burned. The 106 N thrust assumed in the Neptune trip example corresponds to burning 222kg/s in the rocket engine: so, the power output is about 3 GW, or that of five large electric utility power generators. Substantial power is no problem in chemical propulsion, but can be obtained only by means of an equally substantial mass consumption. Designing high-power chemical rockets is quite possible (blurbs for the Space Shuttle main engine boast about the tens of millions HP developed at takeoff); but as their Isp is limited to less than about 450 s, chemical power to accelerate a ship for sustained periods of times means huge propellant consumption. Hundreds of tons of propellants are burned in the few minutes of operation of the liquid rocket engines of a space launcher such as the Shuttle or Ariane 5.